Perrin Pitch Stop Mount SUBARU - Pann Auto Performance - San Diego largest aftermarket automotive performance parts - What do you drive? Reduce drivetrain shudder under hard acceleration by installing a PERRIN Pitch Stop mount. The factory pitch stop mount is designed to control the pitching of the engine and transmission under light to normal acceleration. Subaru’s with power and drivetrain upgrades will need PERRIN’s more aggressive option. Under hard acceleration, the drivetrain is being twisted front to back from front axle torque twist. To control this front to back twisting, Subaru created a pitch stop mount. The factory pitch stop is made of plastic with soft rubber bushings, allowing for a significant amount of movement under hard driving conditions, creating drivetrain slop & shudder. Why do I need the PERRIN Pitch Stop Mount? 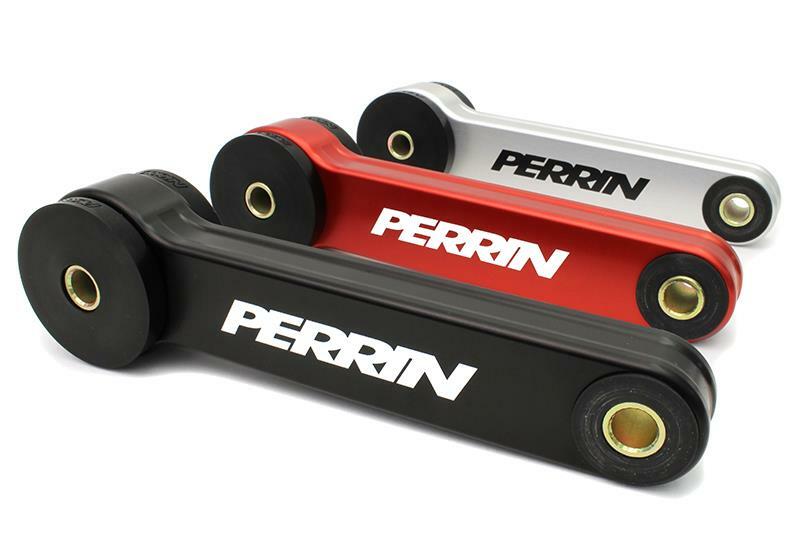 The PERRIN Pitch Stop Mounts body is machined from 6061 billet aluminum .and features stiff polyurethane bushings (not soft rubber). The bushings are as stiff as possible without introducing excessive NVH. (noise vibration harshness).